A gripping tale of love and honor forged between fierce enemies of war, this film tells the story, inspired by true events, of the bold and secret moves that won the peace in the shadows of post-war Japan. Starring Academy Award-winner Tommy Lee Jones, Matthew Fox, and newcomer Eriko Hatsune, this film brings to life the American occupation of Japan in the perilous and unpredictable days just after Emperor Hirohito’s World War II surrender. 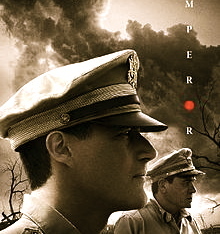 As General Douglas MacArthur (Jones) suddenly finds himself the de facto ruler of a foreign nation, he assigns an expert in Japanese culture – General Bonner Fellers (Fox), to covertly investigate the looming question hanging over the country: should the Japanese Emperor, worshiped by his people but accused of war crimes, be punished or saved?